Jeff is back with another great guest review - take it away, Jeff! I’d like to add a big thank you to Michael for being one of the people on this planet that has kept my interest in toys so very much alive. First reading and then writing reviews as a guest contributor for this site over the last seven years (yeah, even I find it hard to believe sometimes) has kept me not just interested in the evolution of this hobby, but with me able to keep my finger very much on it’s pulse. You see, like most people there was a time when my interest faltered… but like most collectors with the need to ‘gather’ inherently trapped within their genes, it is an interest that will always find a way of returning. And the thing that truly reignited my interest in seriously collecting figures again (I say ‘seriously’ because I never really stopped dabbling) was the reemergence of Hasbro’s Star Wars line in 1995. Whilst perusing the aisles of Toys ‘R’ Us, I came upon the newly released 12” line of figures. The first wave was Luke, Han, Ben and Vader (all in their original ANH outfits). I obviously snapped up all four, even though they were £18 a pop… I know it sounds ridiculous now, but that seemed like a lot of money back then (you can read about their rise and ultimate demise here). Anyway, it reignited my passion for this scale of figures and I pretty much bought every single one that Hasbro brought out, up to and including The Phantom Menace (meaning I still have well over 100 of these guys in my collection). Years later my tastes became a little more discerning (hence why I stopped at ‘Attack of the Clones’, cheezuz that movie was a mess). And so it was that I went on to collect many of the much more impressive offerings from Medicom, Marmit and Sideshow. Because lets face it, no matter how many cool new licenses came along, Star Wars had been in my blood since as an impressionable ten year old boy, way back in 1977 I had been transported to that galaxy far, far away (cheesy, but true). 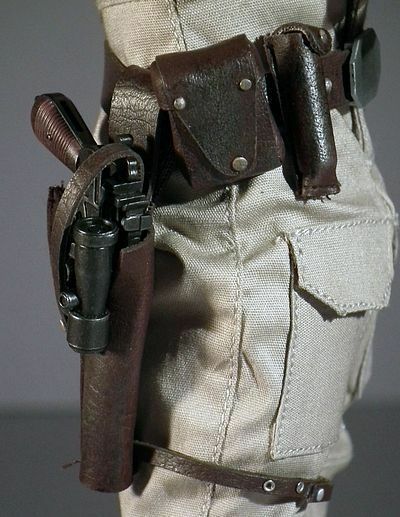 So fast forward to July of 2010, a new teaser add from Hot Toys announces they will be producing a figure of Indiana Jones under the Lucas film license in collaboration with Sideshow, but the sign off is… THE FORCE IS STRONG WITH US! The collecting forums went into a particular kind of geek meltdown trying to best guess what the initial releases would be. Firstly we got the DX Indiana Jones of course, an impressive figure in many ways, but one that didn’t manage to nail Harrison Ford’s likeness 100% (a byproduct of the PERS feature) making his eyes look too deep set. It left collectors divided, even though (in my opinion) it had still delivered the best version of Indy at this scale to date (with an honorary nod to the classic Toys McCoy version). But what would we get from Star Wars. 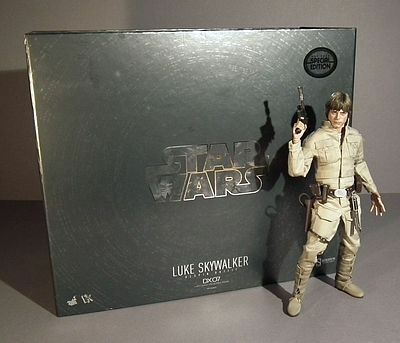 I was pretty sure Luke would be the first release, and I secretly thought it would be the farm-boy, maybe even with an X-Wing outfit thrown in to add to the DX goodness. But the deciding vote went to a certain Mr Howard Chan… and lets face it, if you happen to be a lifelong Star Wars fan who also happens to be the CEO of the company that is producing the figure, then I guess you gotta be able to have a say sometimes. 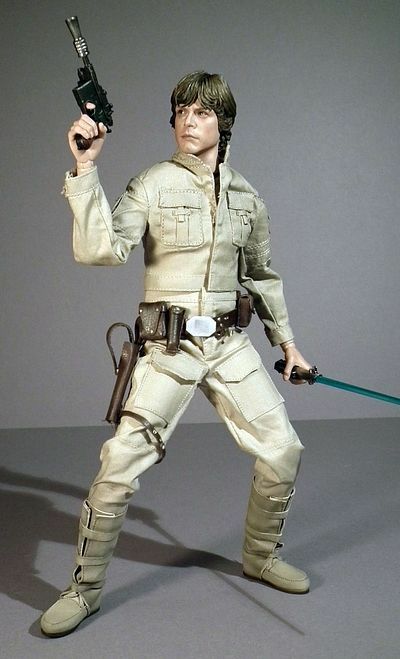 He decided on a little self indulgent nostalgia, meaning the initial release would be the first figure he got from the then Kenner line of figures when he was a mere boy, and that just happened to be Luke, as seen in The Empire Strikes Back wearing what are now lovingly known as his Bespin fatigues. When I first saw the pictures I was very happy. 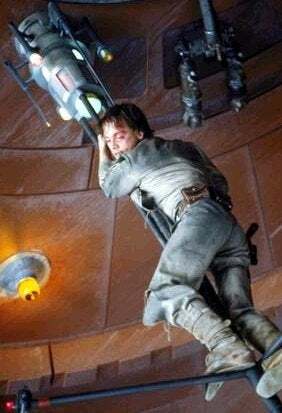 We were to get two full figures, one pristine, the other battle damaged and a cool light up display stand in the form of the communications antenna that Luke grabs onto when hanging beneath Cloud City. 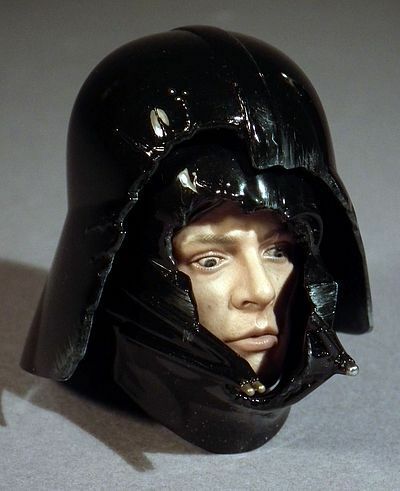 And as an added bonus for those that placed an ‘early bird’ order there was an extra Darth Vader helmet with Luke’s head inside, as seen when the trainee Jedi ventures into the tunnel beneath the ‘dark’ tree on Dagobah. However, if dear reader you are also one of the folks who often visit the many collecting forums that litter the Internet you will be aware of just how fervently ‘passionate’ certain people can be about their chosen license… and by passionate I mean they are often slightly deranged to the point of psychosis! If you are the kind of individual who likes to argue to point of name calling and insult over the minutiae of the stitching on a pocket, go for your life, you’ll love it. If however you enjoy the delights of adult conversation, informed dissection and knowledgeable comparison, it is sadly best avoided! As a reviewer I tend to steer clear of these hives of scum and villainy till well after I have completed my critique. So I look forward to a smug lurk once this is done! But now it’s time to dissect this bad boy, will it make a life long fan happy, or will it stall at the gates? The DX lines packaging is always fabricated of the best quality materials, so from that aspect you already know you are well covered, it’s the finer points of the graphic design we are here to look at. I like this box, I really do, it has an overall grey design with an image of the vast Bespin ventilation shaft, which is both iconic and relatively classy, but it doesn’t really get me that excited! We all know that the usage of any actual stills from the Lucas franchised movies will come with a hefty premium, a premium that will undoubtedly rise even further now the litigious mouse has control of this particular EMPIRE… oh the irony! As I said, the outer surface shows the ventilation shaft, and the ‘cover’ unwinds to the left, after releasing the magnetic clasps on the right hand side. Once open you see the cover sheet that has a folded card insert. This pulls out to show a rather nifty laser cut ‘perforated’ image of Luke on a folded card with a brief bio. Lift this cover out and you see the twin figures lying side by side and the bonus ‘Vader’ head (if you got the special edition), viewable through die-cut windows. Lift out the card cover and you can also see the impressive selection of hands and accessories. This die-cut foam layer can in turn be lifted out to show the final layer, which is a vac formed tray holding the various parts of his two display stands. So, a beautifully constructed and well-designed piece of packaging, but although I like it, it doesn’t excite me much. It seams to be an ongoing thing from Medicom to Sideshow that the Star Wars line is always well done, you might even say classy… but also a just little bit dull! Not since the Bruce Lee figure have we received two fully functioning PERS heads, but even back then you needed to get the ‘special edition’ with the ‘extra’ base body to achieve two full figures. Likewise the DX Joker needed an extra body, and only one of the heads had the PERS feature. But this time we are spoilt, not only do we get two heads, but two bodies and two complete outfits. However, here we are just going to look at the heads. 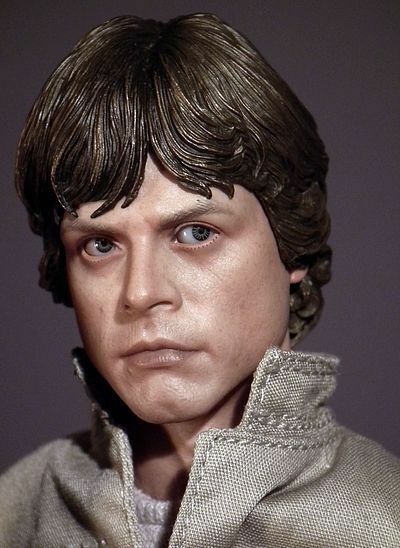 One is a regular portrait of Hamill with a stoic quizzical expression, perfect for general Jedi training on Dagobah, or stalking the corridors of Bespin with your trusty astromech in tow. Whilst the other portrait is pained and desperate… this is the Luke that recently found out who’s the daddy, it didn’t play out well, and it is plain to see on his phizog. I’m guessing these portraits will have many lovers and haters, and perhaps more than a few who find themselves smack bang in the middle, I personally find myself pretty happy. 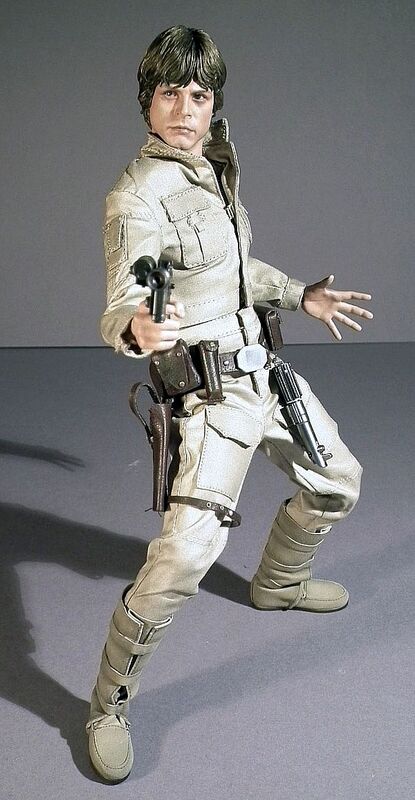 It’s a bit like the DX Indy all over again, as the over all package is a stunning one, and whilst I’m not convinced that Hot Toys have nailed the likeness 100% it still manages to dump on all the previous versions from quite a height. 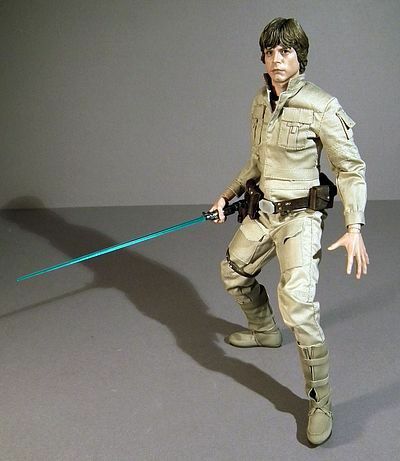 I still have quite a soft spot for the ROTJ Luke that Sideshow put out back in March of 2006, but the years and paint apps have not been as kind to it as I remembered. Of the two sculpts I personally see a slightly better likeness in the pained expression. Both are strong and show a great understanding and sympathy for the subject, but there is something about both Hamill and Ford that is oh so elusive to get completely right. I’m never sure whether it’s because the movies they appeared in are so beloved and viewed multiple times, making us more hyper aware and familiar with every nuance of their faces, or if it is just that they are plain difficult to get right. The other problem can be, that even though Hot Toys have proven time and time again that that they can produce a sculpt that is virtually perfect, it then has to be approved by the licensor. And we all know that many a masterpiece has been rejected because of vanity or marketing! 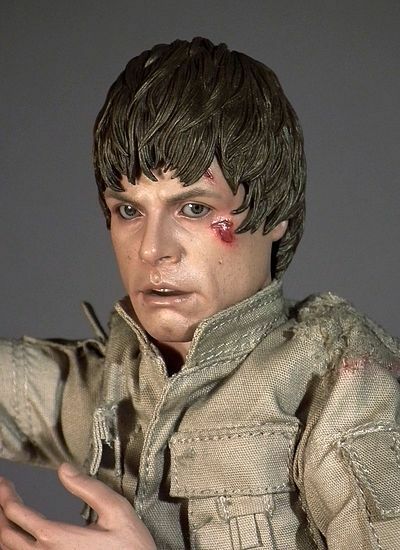 So what we end up with are two very strong portraits my the renowned KoJun who once again illustrates just how talented he is, and gives us the best 1/6th scale Luke Skywalker’s yet. As I said above, the fight weary Luke manages to claw ahead for me, and this is mostly down to the general shape of the face. Here his cheeks are slightly fuller and the chin rounder, which to my eyes represents Hamill better at the time he was staring in Empire. 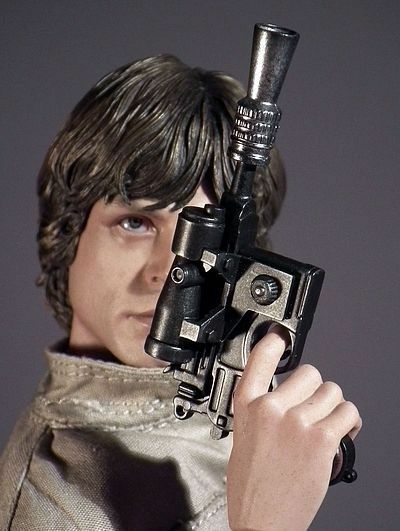 The other sculpt is growing on me more and more with each passing day, and I see more and more subtle details every time I repose it, but the shape of the chin on this portrain is just a fraction too chisled and lean, making this the idealised version of how Luke ‘should’ have looked. And I find myself wondering if this might have had more to with those pesky licensors than the creative talent behind making it! I’ve always been a fan of KoJuns work on hair sculpting, ever since I got the Goemon figure he produced back at the start of his relationship with Hot Toys. He has an incredible talent for picking out and defining each strand of hair, and he makes it look effortless in the way it seems to fall with a natural fluidity. I find it tough to decide which of the two hair sculpts I prefer as they both capture key moments and looks from the movie. 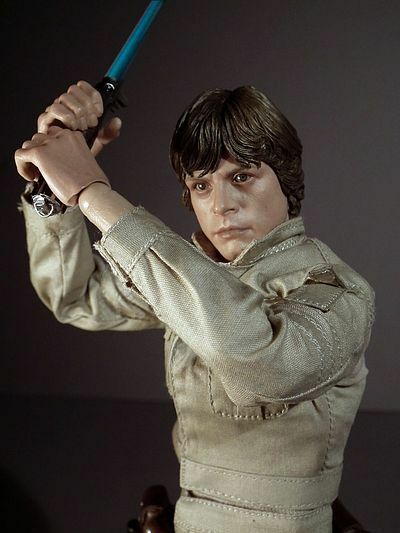 The general one showcases the traditional ‘Luke’ hair, with its slight late 70’s early 80’s bouffant look. Don’t worry, its not a full on Barry Gibb or Farrah flick, but to those old enough to remember living through this period, it was something of a classic style. The detail in the layering of the style is beautifully rendered, making the hair alone worthy of special note. The second style represents how his messed up hair looked as he gripped tightly to the weather vane before dropping down the massive atmosphere vent and and becoming entangled in the communications antenna. As such it shows not only that he is beaten, sweaty and roughed up, but also hints that it is wind blown and ‘mid’ flowing movement. If I was awarding my score on hair alone this would romp home with a full score, but as it is, taking all of the elements into consideration I end up keeping it just shy. The portraits are incredibly strong, but not quite as strong as some of their very finest work! We can all chase our tails on which of the two portraits we prefer, but the aspect that is unequivocally strong is the paint app. JC Hong is of course the master of ceremonies, and he delivers another clean, fresh and crisp paint treatment. A special mention must of course go out to the team of painters, who under his expert guidance actually manage to consistently keep pumping out these faultless applications in such great numbers. Both have beautifully rendered flesh tones over the surface of the skin, with all the usual microscopic work on the subtle mottling and pores. As stated they both have the PERS feature, so the ocular orbs are small perfectly formed glass eyes rather than being painted, and they manage to look uncannily realistic. With their glossy wet finish, catching the light with an almost spooky realism. The hair is also quite a revelation. In so much as it caries a lot more colour than Hot Toys figures usually do. What I mean is that where as the sculpt usually lets the light do all the work, this sculpt actually has some very subtle graduations in tone, which really helps that sculpt sing! The range of movement and general posability is fantastic on both figures, as not only do we have highly articulated True Type under the uniforms, but his fatigues offer virtually no restrictions to his mobility as well. I’m sure that most regular readers know what to expect from the classic range of True Types, but if for whatever reason you are not you can check out these links here, here and here to bring you up to date. 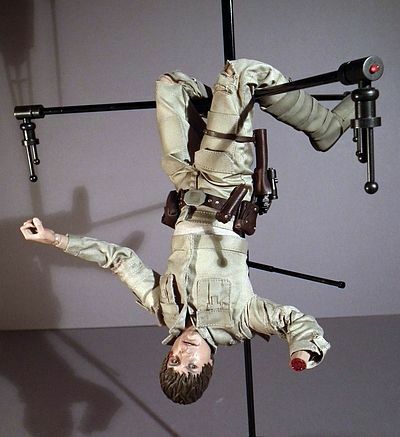 Suffice to say you will have no problem getting him into a duelling pose with Vader or hanging in desperation from that communications aerial, and what ever pose you decide on, with just a little work and futzing will look spectacular. The thing the True Type has had in the bag for a long time now is its ability to strike very convincing poses, hanging with an almost unsurpassed realism. And the choice of a slim frame suits this character to perfection, easy full score. The star of the show is obviously that cool weather vane, it is primarily made of metal with plastic mouldings at the top, base and at the end of the arms. It comes in kit form, but putting it together is a cinch! The two upright sections just slot together, then side arms simply screw into the vertical body. The lower part of the structure then slots into a stand for if you plan to display it on a shelf or in a cabinet. However there are instructions supplied for fixing the upper part to a ceiling or wall, which if you have the space to do so would look pretty killer (but be a dusting nightmare). He also comes with two other stands, one is wedge shaped and made to look like a section of flooring from the carbon freezing chamber, this also has the silver DX plaque on its front, whilst the other is the classic black oval. I found that the cool boot design meant that both figures could stand solidly and with ease, but the themed base is cool enough for me to include in a display. As for the oval design, well I’m sure it will do its job for those that use them, but I’ve made my feelings distinct over the years that the use of stands should only be a last resort. Lets face it, if you want to shatter any illusion of these figures being small facsimiles or people, the best way to do that is to prop it up on a ruddy great figure stand… but each to their own! Next up are his various weapons, in the form of identical twin blasters with their silver flash suppressors (part of the reason I always preferred Han’s was its total black badassness). The detailing here is fantastic, even if there are no moving parts, but as there weren’t strictly speaking any on the prop used in the movie that’s all OK. The Lightsabre hilts also show a great degree of detailing, with minutely observed and crisp tooling on the tiny buttons and ridges. This has always been my favourite Lightsabre design, for the pure and simple fact it looks like a real world tool (its also the only one I own as a full sized prop version). It has features that seem to be there for inexplicable reasons, rather than the over designed and overly ‘elegant’ versions we saw in the prequels. One sabre is purely the handle to hang from the belt, whilst the other has a translucent blue shaft of energy… well, blue plastic! 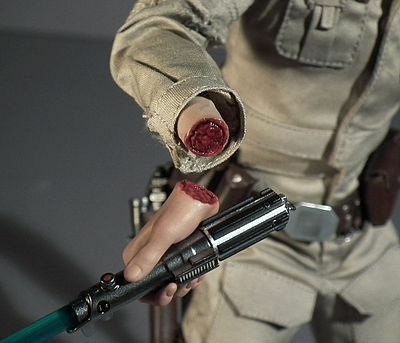 He also comes equipped with the medical device that Leia places over his stump, it’s well detailed and fits well, but sadly is not a look I will be displaying my figure in. The one trick they did miss is that the device needs to fix to a regular arm, as there is a small cup at the end of the inside to push a wrist peg into. The inclusion of a small magnet here to attach to the medi-stumpomatic 3000 to would have been even cooler! Which brings us nicely onto the extra lower arm and severed hand. I found that the arms swapped over just fine without me having to break into a sweat over potential breakages. Once swapped you have nice bloody stump to which you can attach the extra magnetic hand. 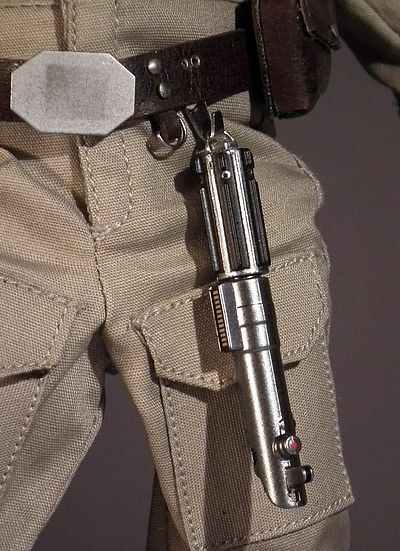 This is in a gripping position so it can hold on tightly to hilt of the Lightsabre. However I did find that the weight of the sabre means this hand can’t be used in a regular pose, as the blade will turn and droop down. The last accessory is also up there with the coolest of cool. It’s the severed Darth Vader head that is seen briefly in the scene where Luke has a force-induced apparition of facing down with Vader, the son becomes the father and the father becomes the son etc… discuss! Anyway it’s a beautifully rendered object, with great proportions on the helmet, and a killer likeness on the face that you can see through the shattered section at the front. They even gave a nice charred and cauterised treatment to the stump of the neck that can be seen from below. So ultimately this is actually a three head sculpt release, and the combined parts add up to an easy full score! 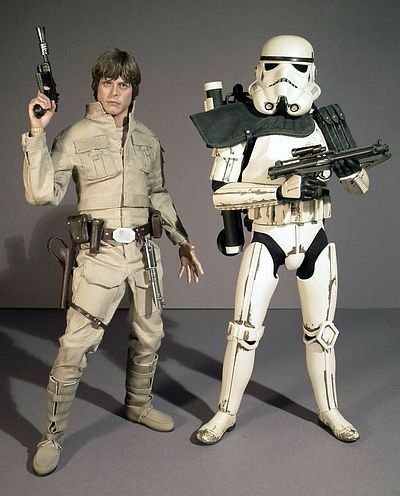 Luke wears two slightly different versions of an identical outfit. One is fresh, clean and undamaged, as is befitting the rank of Commander in the Rebel Alliance, whilst the other is battered, frayed and torn as is befitting one who is headstrong, reckless and untrainable! So, he comes with fabric constructed boots which not only manage to look great, but also mean the articulation at the ankle is virtually uaffected, a big bonus in my books. The trousers and jacket are of a classic military design, that seem to borrow their cues from British WWI outfits, with the large patch pockets on the thighs, high waist o the trousers which is matched by the short cut off on the jacket. All the patch pockets with their accompanying tabs seem to be fully functioning. Under the jacket he wears a beige singlet that can just be glimpsed through the open collar of the jacket. I did take a few shots of the figure with the jacket off, and the garment looks good. 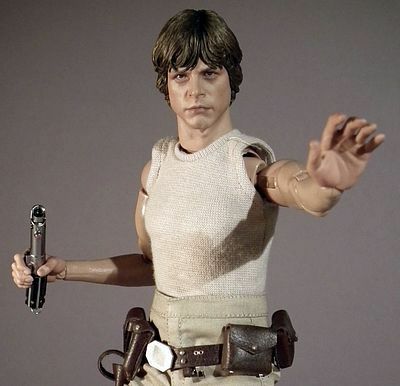 However if you want to display Luke in his Jedi training look from Dagobah, you may want to invest in a new muscle body. I have no intention of doing this, and I’m mightily happy that they decided to go for a regular TT under the outfits, as the range of poses available with it are fantastic. Lastly there is the holster and utility belt, I love this part of the outfit. It’s a near perfect facsimile of the belt worn in the movie, even down to the random square polished patch within the hexagonal buckle, now that’s the kind of detai that we love. Rather than being sculpted plastic the whole belt is made from pleather with microscopic stitching and rivets applied. All the requisite holders and pouches are here as is the small hook to hang his lightsabre from and the drop holster for his blaster. From the holster is a strap that goes around the right thigh and another strap with a magnetic clasp that goes over the top to hold the blaster in place. So, two well tailored and great looking outfits, and as I said above the only real difference is the battle damage on one of them. This consists of tears, rips and scuffs, and the attention to detail on getting this weathering to look as convincing as possible is as outstanding as you would expect from a Hot Toys DX figure. An easy full score, I’m just loving those boots and that belt! The diorama comms array is really a rather nifty bit of kit, with a design and fabrication that are well thought through, robust, easy to set up… and dismantle should you need to. Its cool bonus feature is the ability to light up. 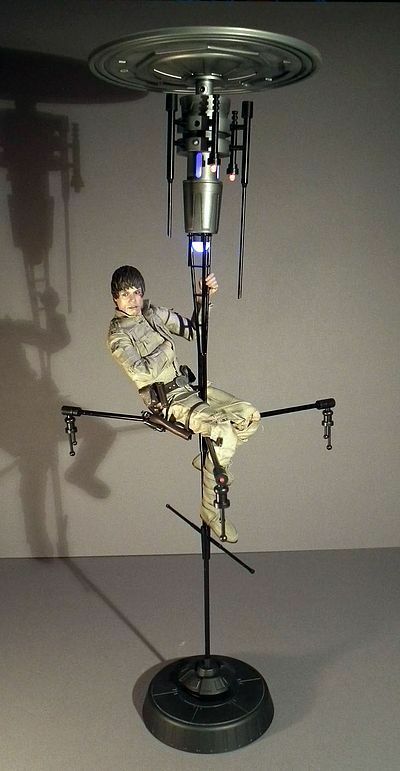 Once the batteries are all in place you simply push in a button on the top section and a cool blue glow emits from the domed bottom section and side panels whilst the small bright red lights at the end of the drop down aerials blink on and off intermittently. It makes for a great looking display piece, and I just wish it was able to plug into the mains so I could leave it on without worry of draining the batteries. I have however had it on quite a few times for reasonably extended periods and they are shining just as brightly at the moment! Here we are with the DX 7, and we’ve had the 8-9-10 and11 delivered as well. All the DX figures feature the unique PERS (parallel eyeball rolling system) to help inject just that bit more realism to their figures. I say unique, because we are all familiar with a doll having moving eyes. 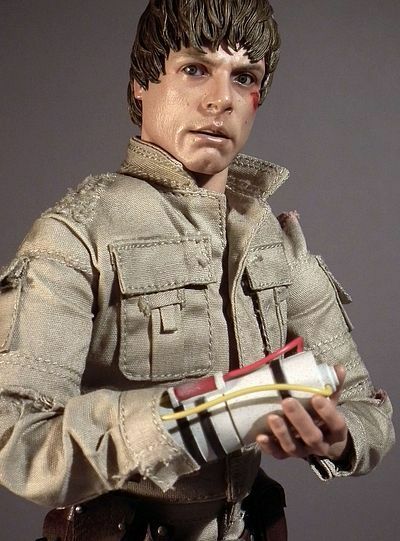 From the simple rocking mechanism of a child’s baby-doll that closes its eyes when reclined, to the classic eagle eyes feature that Action Man (GI Joe) first got way back in 1976. Some customisers, ZC Toys and ENTERBAY also saw its potential, reintroducing it as a feature just a few short years ago. But Hot Toys took the idea and applied just a little more engineering know-how to the feature. Sure, Action Man had a small switch in the back of his head, but all he could do was look left and right. The ENTERBAY version was cool and had the ability to look in all directions, but you needed to position the eyes separately (very handy on their Mr Bean figure for some comedic expressions) but was sometimes a little more fiddly and awkward on the Bruce Lee figures. 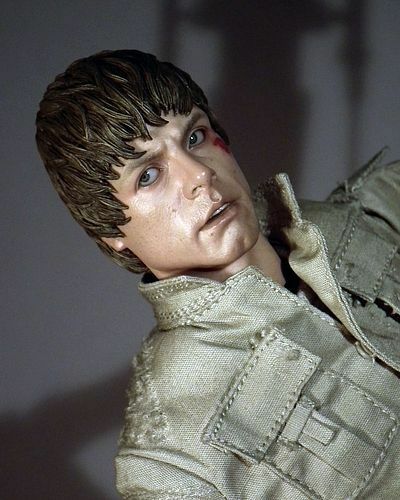 So what Hot Toys developed was the ability to move the eyes in a full swivel action in all directions, by means of one small joystick hidden within the head. This is usually accessible by removing the hair or a back section of the head. It’s a feature that has stayed relatively unchanged since the first DX01 Joker, but has obviously had tweaks along the way, as the mechanism now seems much more smooth and reliable. I know it’s a feature that has its lovers and haters. But when it works well, as it does here, it’s a great bonus! 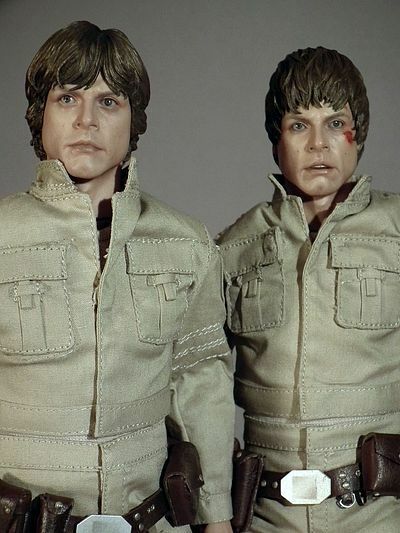 Two complete figures of Luke Skywalker, a huge light up base, c’mon, wadayouthink? OK, OK, this is a set that costs a whopping $300. Some of you may be thinking I’m crazy to award a full score… yes a FULL score, but for Darwin’s sake this is two complete figures and an impressive environment base. So what price does one put on the base? Lets imagine if you will ladies and gentlemen of the jury, that this was an item that was packaged and marketed as a product in its own rite… what would it cost? I’m going to conservatively say $50, though thinking back to Sideshows expansion packs and recent E-Web cannon, I have a feeling it would be more like $80 to $125. However, I have said $50, so $50 it is! 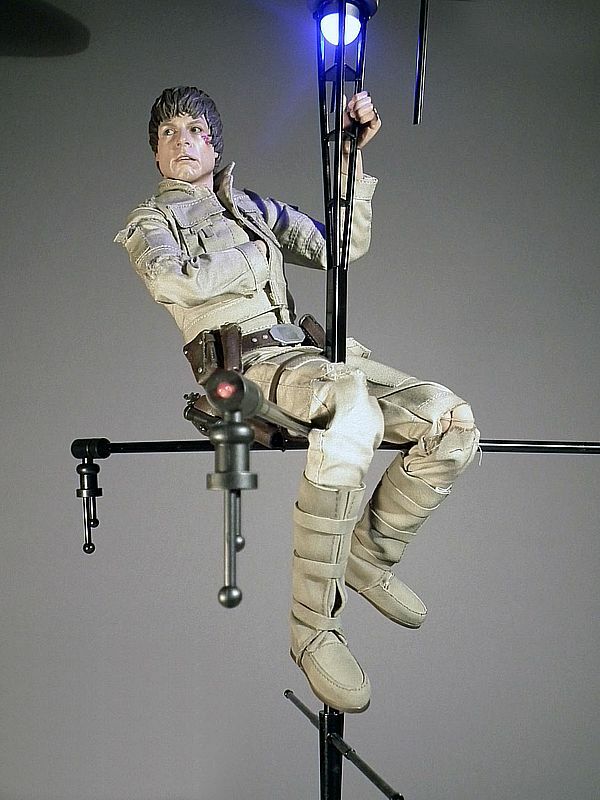 That leaves us with $250 to split between two full figures, meaning they are $125 each… now remember that these still have a fair range of accessories even without the environment base, and both have the PERS feature, but most importantly of all, this is Luke ‘fricken’ Skywalker, a fully licensed Star Wars figure! The defence rests… your argument is invalid! My figure of year for 2012 went to Iron Monger, it was just way too a spectacular figure not to be honoured with the prize. But the closest competition it faced was between the 89 Joker, The Samurai Predator and this guy. And for me this manages to steal the silver because it was a pretty close call between the Monger and the Luke’s. Of course that means the Joker and Pred have to share a joint bronze, sorry guys, it was a tough year! There is just so much to love here, from that really cool display stand/environment through to the fact we get two complete figures. It has made me realise that I just can’t live with my two diminutive Medicom Vader’s anymore… c’mon Sideshow, stop messing about and give us a new definitive Vader! I didn’t bother with the first one, it seemed a little vanilla after getting two from Medicom that featured full face reveals. It’s time you delivered something that shows your full potential… don’t let us down, I’m watching! 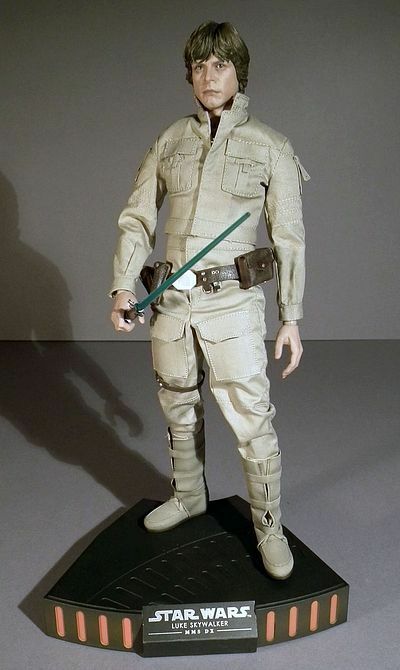 The regular version of the figure, without the exclusive Darth Vader helmet was still available with sideshow at the time of writing for $299.99, the exclusive version was the same price for the early birds. Or you can try eBay where BIN prices are between $290 up to $370.